As one of the world’s most profitable gold hotspots, the UAE is an important destination for any serious gold market investors looking to maximise their profits. In fact, its fame is so widespread that its capital, Dubai, has come to be referred to as the ‘City of Gold’, illustrating the benefits of the UAE gold rate and the sheer scale of wealth that changes hands in the region. Of course, one of the first steps for any investor is to find out what the UAE gold rate is. This will allow you to trade in this beautiful precious metal when the price is in your favour. Like in other countries around the world, the gold price here is largely affected by global trading conditions and will fluctuate in response to periods of political and economic uncertainty and confidence. In the UAE, gold is priced in AED (United Arab Emirates dirham), which is pegged to the value of the American dollar at $1 = 3.6725 AED. This means that the trading price of a troy ounce of gold in the UAE is the same as the US dollar gold price, simply multiply by this figure to factor in the exchange rate. The spot price of gold does of course fluctuate in all currencies. But unlike Sterling or the Euro for instance, the UAE gold rate is always proportionate to the dollar price. Prices in other currencies are influenced by external factors such as their own exchange rates or trading conditions. Dubai has long been considered a favourable backdrop for the gold market due to the low taxes that it imposes on trade of the commodity. While it’s true that there has been a VAT rate of five per cent introduced on gold in Dubai in 2018, it should be noted that this does not apply to precious metals for investment, but rather to jewellery. In practice, this means that you should not be paying VAT on a gold bullion bar or many of the gold bullion coins for sale. 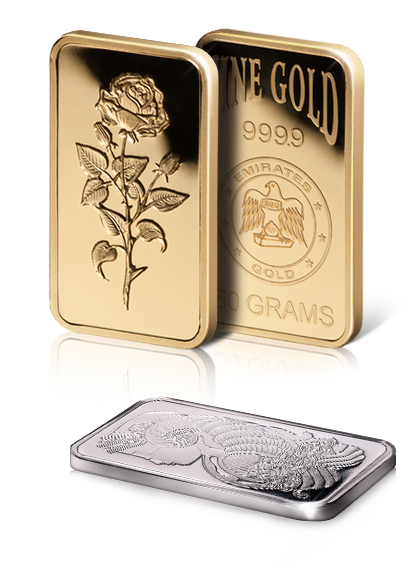 The UAE gold rate governs the price of a wide range of different gold products. While the region has its own gold refineries and bullion producers – such as Emirates Gold and Al Etihad Gold – it is perfectly possible to buy many of the most popular global names in Dubai as well. At Kuber Jewellery we stock PAMP, Umicore, Valcambi, Emirates Gold and much more. Contact us to take advantage of our competitive gold purchase and sale prices.